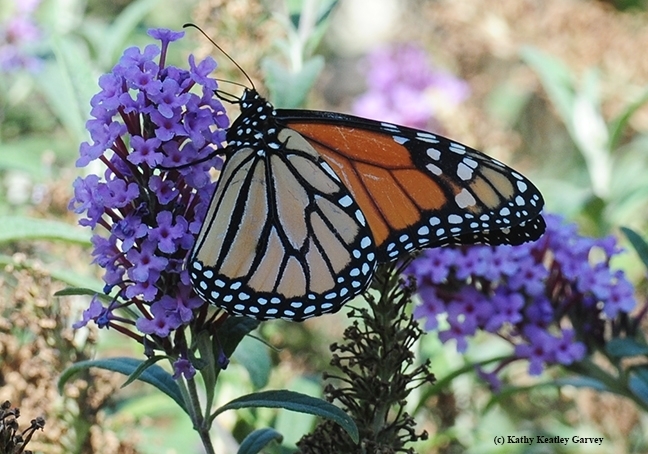 Monarchs: you can't save them all. 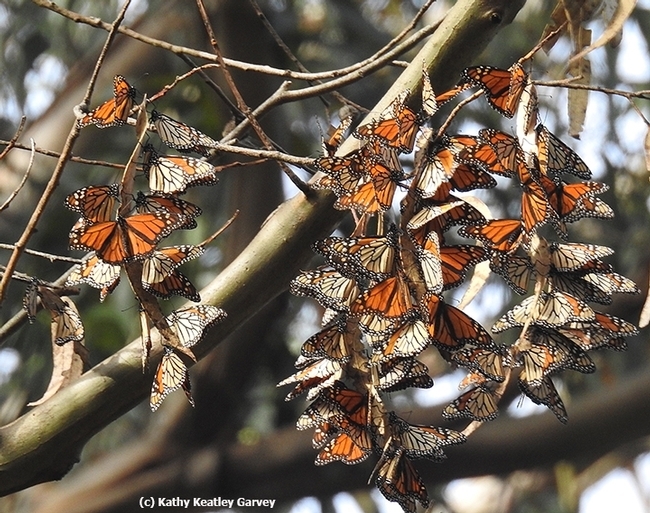 It was a dismal year in Vacaville (and other parts of California) for monarch-rearing. Of the 10 caterpillars we collected from milkweed in our pollinator garden in early September and tried to rear, only eight made it. One caterpillar died when a sibling attacked it. Another caterpillar made it to the chrysalis stage, and then it succumbed. "The intersegmental membranes are showing," observed butterfly guru Art Shapiro, UC Davis distinguished professor of evolution and ecology, who has researched butterflies for more than four decades and maintains a research website at http://butterfly.ucdavis.edu. 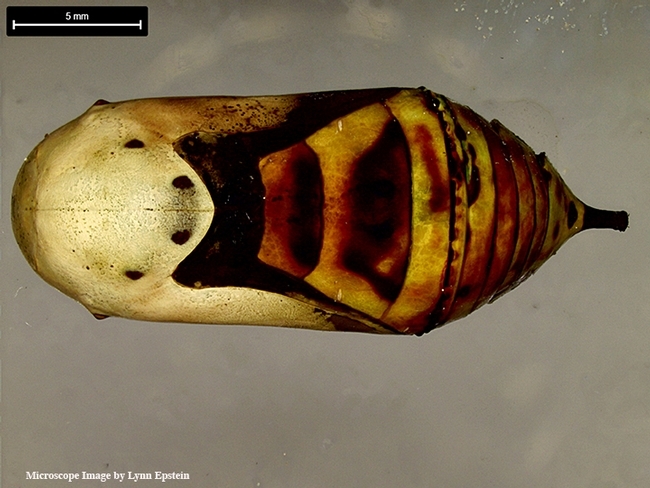 "Whatever caused that, it opens the door to severe water loss, so the pupa will probably die." 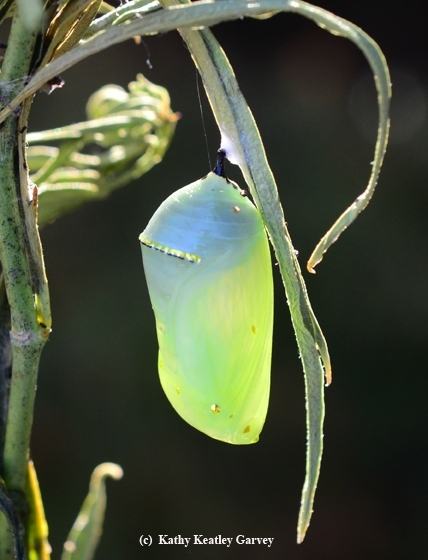 Black lines rimmed the non-viable chrysalis, and then it deteriorated almost beyond recognition. Lynn Epstein, UC Davis emeritus professor of plant pathology, photographed it under a Leica DVM6 microscope on Nov. 2. An amazing image. 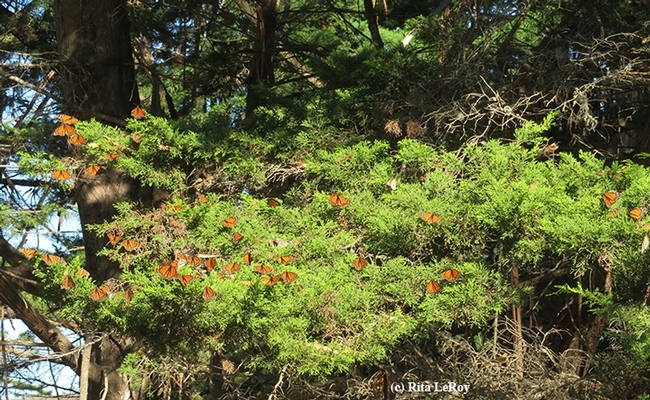 Meanwhile, perhaps the eight monarchs we reared and released made it to an overwintering site along the California coast...maybe to the eucalyptus grove at the Natural Bridges State Park, Santa Cruz. Or maybe they encountered a predator--a praying mantis or a bird. 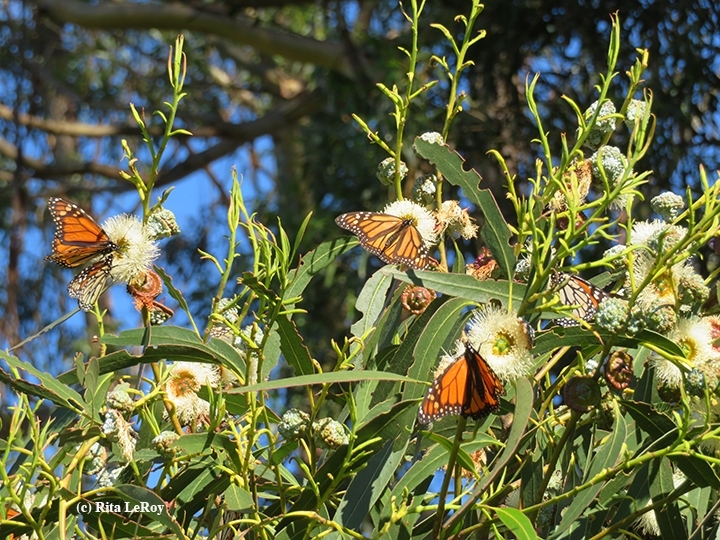 Regardless, the declining monarch populations at the overwintering sites along coastal California are troubling. The Xerces Society for Invertebrate Conservation, based in Portland, Ore., noted in a news release Feb. 2, 2018 that the "annual census of monarch butterflies overwintering along California's coast reveals that populations in western North America are at their lowest point in five years, despite recovery efforts. Volunteers with the Xerces Society's Western Monarch Thanksgiving Count visited more sites this past year than have ever been counted since the survey began in 1997, yet they tallied fewer than 200,000 monarchs." “This year's numbers indicate a continuing decline in the monarch population,” noted Sarina Jepsen, the Xerces Society's endangered species program director. “Two decades ago, more than 1.2 million monarchs were recorded from far fewer coastal sites, and just last year nearly 300,000 monarchs were observed at almost the same number of sites.” Population estimates at individual sites also suggest that the western monarch population has continued to shrink. Of the 15 sites which have been monitored annually for more than two decades, 11 had lower counts than last year." 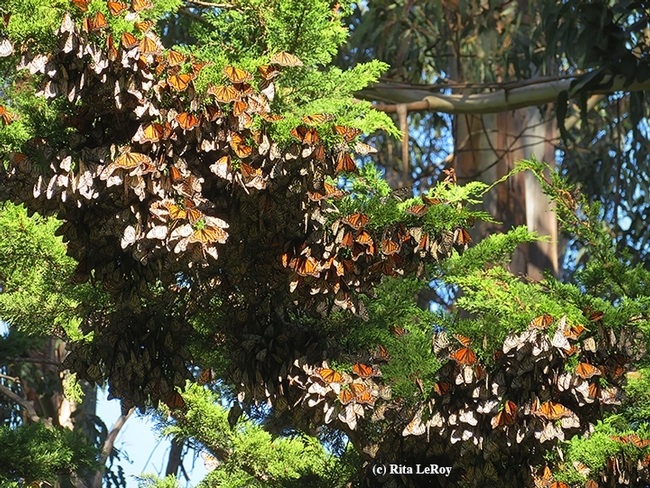 Xerces Society officials also noted that "the few sites in which monarch numbers remained stable or increased compared to 2016, include Natural Bridges State Park, Moran Lake, and Lighthouse Field State Park, all in Santa Cruz County." We like to think that The Vacaville Eight were The Lucky Eight. 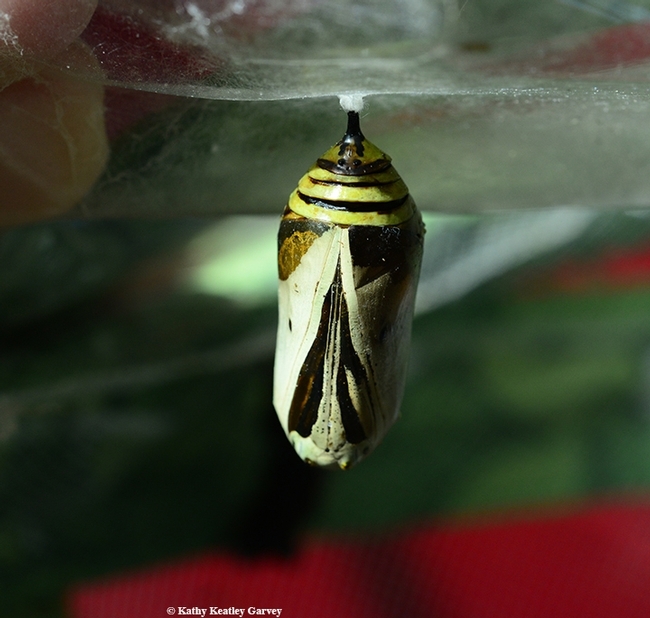 Lynn Epstein, UC Davis emeritus professor of plant pathology, captured this image of the monarch chrysalis on Nov. 2 with a Leica DVM6 microscope. 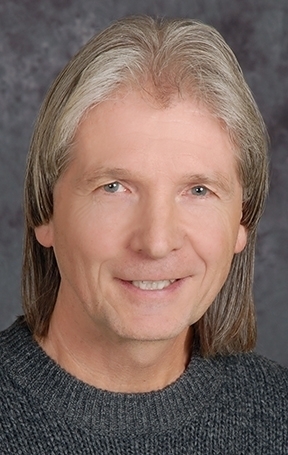 Newly published research by entomologist David James of Washington State University, Pullman, Wash., in the Journal of the Lepidopterists' Society yielded incredible news about the monarch population that migrates from the Pacific Northwest to California. The research paper covered the first five years, 2012 to 2016, of the ongoing project. Citizen scientists tagged and released nearly 15,000 monarchs in Washington, Oregon, Idaho and British Columbia in the late summer and fall. The number recovered? Sixty. "On average, these butterflies averaged almost 40 miles of travel each day," James told the WSU News Service. "That's pretty remarkable for such a small creature." One of the monarchs released Aug. 28, 2016 in Ashland, Ore., by citizen scientist Steven Johnson fluttered into our yard in Vacaville, Calif., on Sept. 5, a 457-kilometer journey. We happened to be home and photographed the traveler, a male. The discal cell tag read "monarch@wsu.edu 6093." WSU is my alma mater, so double excitement! What was the longest recorded journey? A monarch that David James released in Yakima, Wash. It was recovered near Goleta, Calif., a distance of 845 miles. Scientists believe that monarchs ride warm air currents (thermals) a few thousand feet from the ground. Then, they use strong upper-air currents to navigate. It's a long, tough journey, averaging nearly 500 miles, and often with strong winds, heavy rain, or triple-digit temperatures. They need food (nectar from flowers) and often they don't escape predators, including birds, praying mantids and spiders, and such diseases as Ophryocystis elektroscirrha, a protozoan parasite. Perhaps some day migrating monarchs will be microchipped, if a lightweight chip is invented. 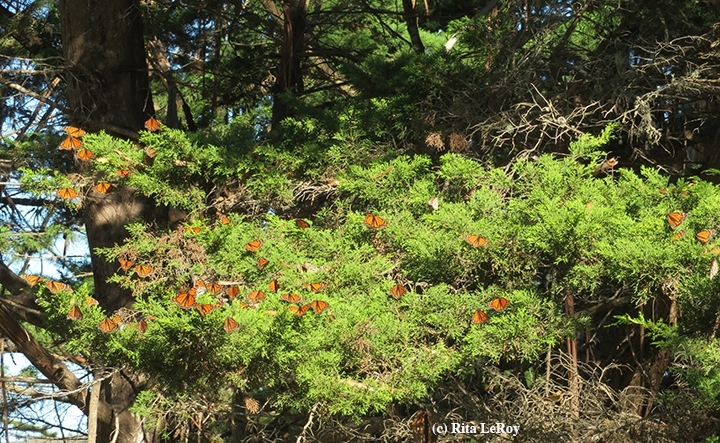 "Then we can just chip 100 or 200 butterflies and not tag 15,000," James pointed out. 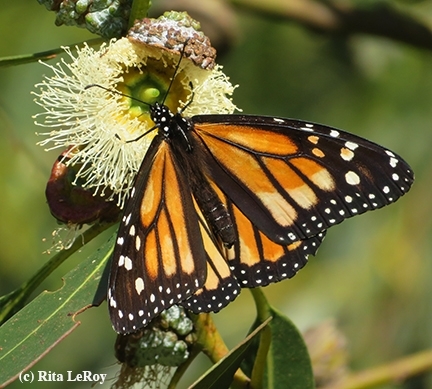 The research paper is titled "Citizen Scientist Tagging Reveals Destinations of Migrating Monarch Butterflies, Danaus plexippus (L.) from the Pacific Northwest." (See this site for the full text). 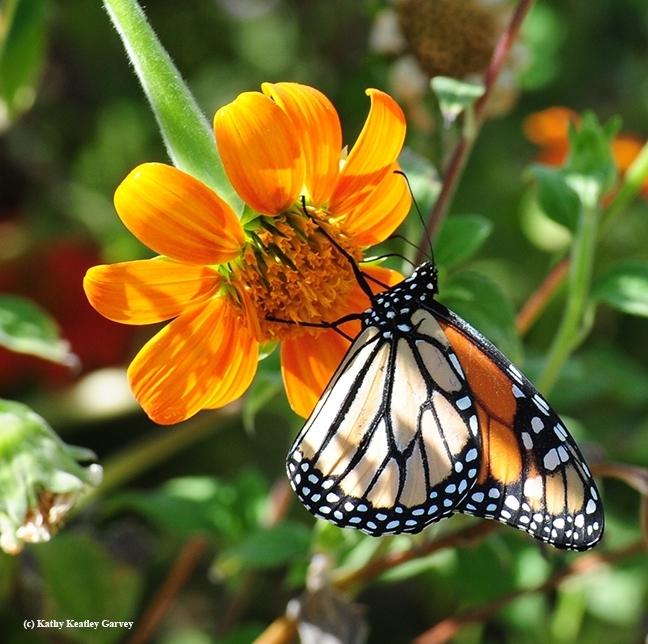 The fall migration of Monarch butterflies (Danaus plexippus) in the Pacific Northwest (PNW) was studied in an unfunded citizen science project during 2012—16 by tagging 13778 reared and 875 wild Monarchs. More than a third of these Monarchs were reared by inmates of the Washington State Penitentiary (WSP) in Walla Walla, Washington. 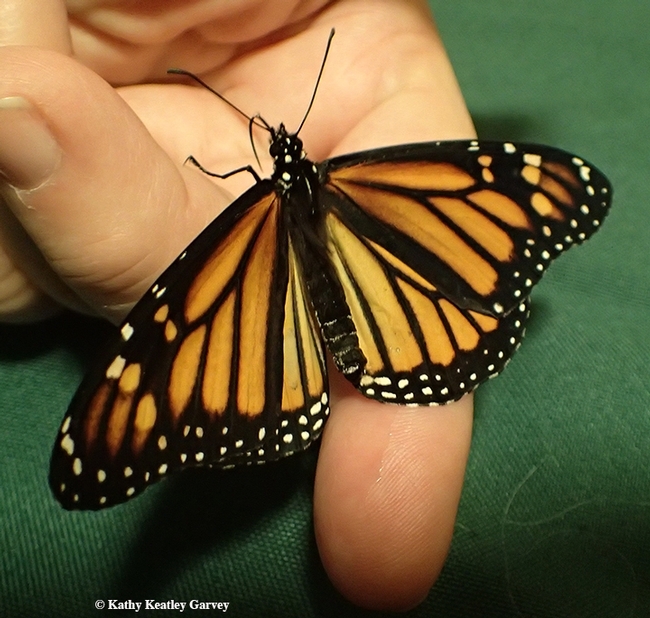 Sixty (0.41 %) tagged Monarchs were recovered from distances greater than 10 km (mean: 792.9 ± 48.0 km) with most found in California, SSW of release points. One WSP-reared Monarch was found 724 km to the SE in Utah. Monarchs tagged in Oregon flew SSE to California. 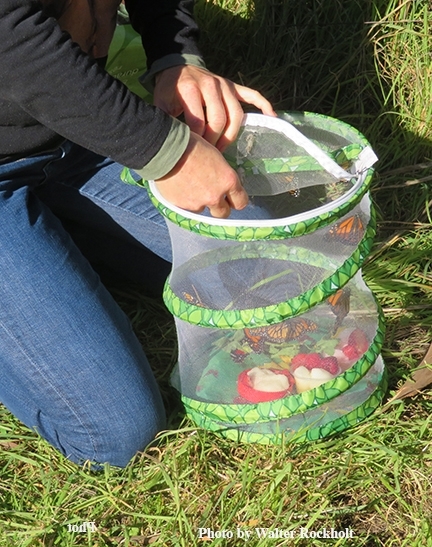 No Idaho-tagged Monarchs were found in California but two were recovered at locations due south. 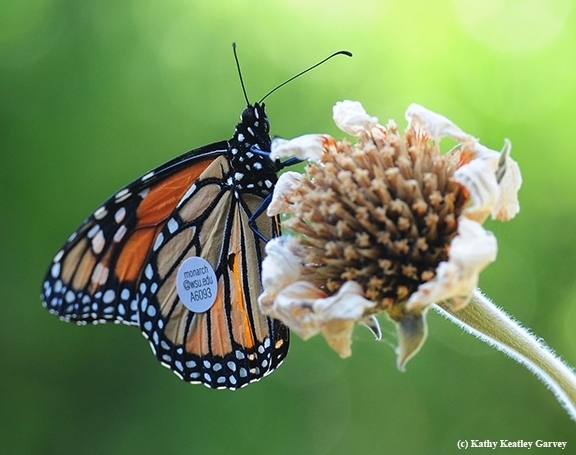 No wild tagged Monarchs from Washington, Oregon or Idaho were recovered. Monarchs from Washington and Oregon were found during October-February at 24 coastal California overwintering sites spanning 515 km from Bolinas to Carpinteria. A single wild spring Monarch tagged in May in northern California was recovered 35 days later and 707 km ENE in Twin Falls, Idaho. This study provides compelling evidence that many Monarchs in southern and central parts of Washington and Oregon migrate south in the fall to overwintering sites along the California coast. It also provides some evidence for southerly and south-easterly vectoring of migrating Monarchs from eastern Washington and Idaho, indicating the possibility of migration to Arizona or Mexico overwintering sites. In addition to improving our understanding of Monarch migration in the PNW, this study also contributed to conservation by adding nearly 14000 butterflies to the population. The incredible involvement of incarcerated and non-incarcerated citizen scientists generated much community and media interest which in turn led to greater involvement by citizens. Increased awareness of Monarchs, their biology and conservation in the PNW has been an unexpected but important spin-off of this study." Plant nectar-rich flowers. They need flight fuel to continue their journey to the overwintering sites along coastal California. Keep your eye out for tagged migrating monarchs in the late summer and fall and try to photograph them. 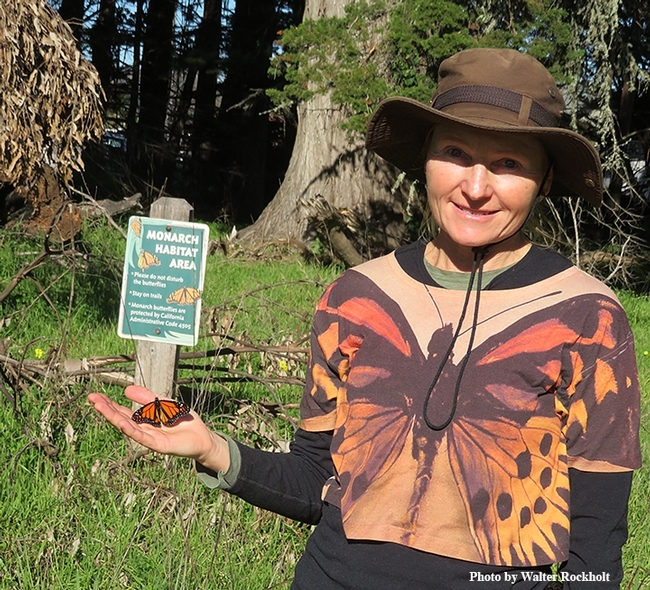 Visit overwintering sites, such as Natural Bridges State Park in Santa Cruz and the Monarch Butterfly Sanctuary in Pacific Grove, and look for--and record--tagged monarchs. Stay up-to-date by following the Facebook page, Monarch Butterflies in the Pacific Northwest. It now has nearly 5000 followers. It is not a good time to be a butterfly. Especially if you're a monarch butterfly that eclosed on Jan. 5 in cold and rainy Vacaville, Calif. while all--or most--of your counterparts are overwintering along coastal California or in central Mexico. You don't even count; scientists and citizen scientists have already counted the overwintering monarch population and you're not there. They do not know you exist. You're nestled inside an indoor meshed butterfly habitat on a kitchen counter. Outside, a storm brews, not unlike the nearby coffee pot gurgling away. Inside, fingers of warmth comfort you. You sip a mixture of honey and water, and then orange juice. You sample the raspberries and blueberries. At night you perch on a rosemary branch. You wake up to the sounds of National Public Radio and the coffee pot gurgling. People come and go and look at you. "What are you doing here?" You ignore them. You are alone. Your parents met and mated sometime in November. Your 11 siblings and cousins all eclosed on the last of the tropical milkweed, leaving you with basically nothing. You are the last one. A mid-life chrysalis if there ever was one. And now a maverick in the making. It's too cold and rainy to fly. And then one of those humans comes by with a silkscreened garden flag and lifts you gently out of your zippered habitat. You eagerly investigate your new territory. You see a male monarch and a honey bee looking back at you. Life imitating art, or art imitating life? This is a story about how eight monarch butterflies escaped the freezing temperatures of Vacaville, Calif., and hitchhiked to sunny Santa Cruz, thanks to Good Samaritans (Good Monarcharians?) Rita LeRoy and Walter Rockholt of Vallejo. It all started in mid-to-late November when 12 caterpillars surfaced in our pollinator garden in Vacaville. What! What are you doing here? Didn't you get the memo? We'd just reared and released 54 monarchs. We'd just winterized the garden, pruning back the plants except for one flowering tropical milkweed. We'd leave that for the pollinators, and then, it, too, would freeze. Well, so would the 12 monarch caterpillars. Twelve! A dozen hungry, hunkered-down striped ‘cats. Talk about challenges! Too cold, too rainy, too little food and too many predators to survive. Could these monarchs be starfish? Eight Danaus plexippus eclosed or “hatched” in mid-December. 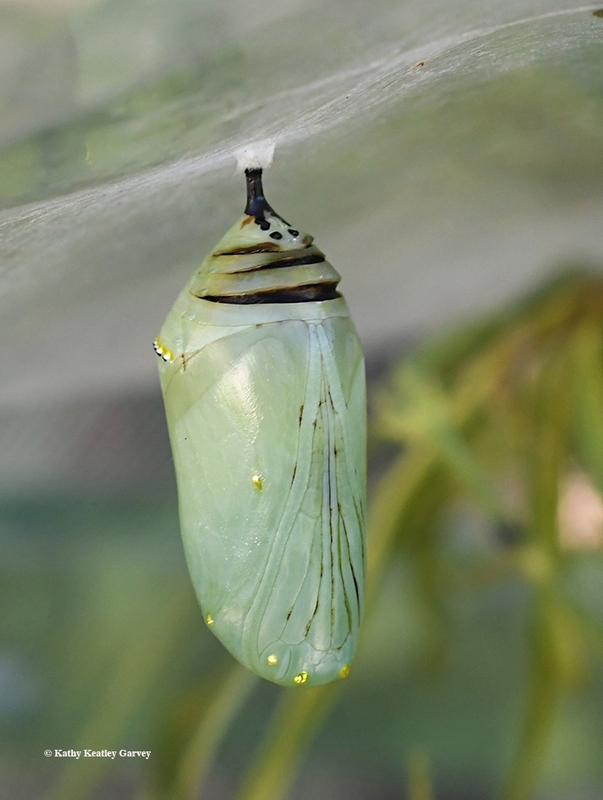 We marveled as each new butterfly clutched its transparent pupal case, pumped its wings and prepared for flight. Of the last three, one eclosed on Christmas Eve, one on Christmas Day, and one on Tuesday, Dec. 27. Despite the severity of the season outside, the monarchs thrived on the care and warmth inside. They fluttered around, dined on raspberries, orange juice and sugar-water, and roosted on the sides and ceiling of the butterfly habitat while National Public Radio “entertained” them. What to do? Consider them “starfish” and drive “The Monarch Eight” to an overwintering spot along coastal California? (We'd just been to Santa Cruz, a 226-mile round trip, on Nov. 14.) Release them in Vacaville on a wing and a prayer? Or transport them to the Bohart Museum for “bed and breakfast” and public observation? A friend who's an educator, a naturalist, a photographer, and an insect and gardening enthusiast came up with the ahh-so-perfect plan. Rita LeRoy, the 26-year “farm keeper” at the Vallejo City Unified School District's Loma Vista Farm, (a 5-acre outdoor classroom that provides hands-on educational activities involving plants and animals for children of all ages and abilities), told us of her pending trip to the monarch overwintering sites in Santa Cruz and said she'd be delighted to take them there. 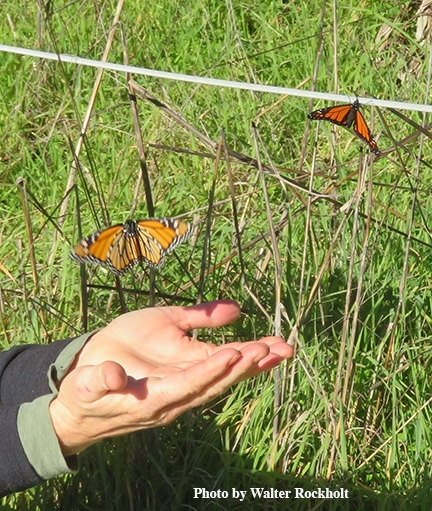 So off the Vacaville-bred and reared monarchs went on Wednesday morning, Dec. 28 with the Good Monarcharians from Vallejo. Unlike Rita and Walter, however, the monarchs didn't know where they were going. One minute they're listening to NPR on a kitchen counter in Vacaville, and the next thing they know, an hour-and-a-half later, they're joining their buddies in Santa Cruz. Whoa! How did that happen? How'd we migrate that fast? Rita LeRoy, known as "Farmer Rita" at Loma Vista Farm, released them, one by one, starting at 1 p.m. at the Lighthouse Field State Park. Flight! Freedom! Friends! 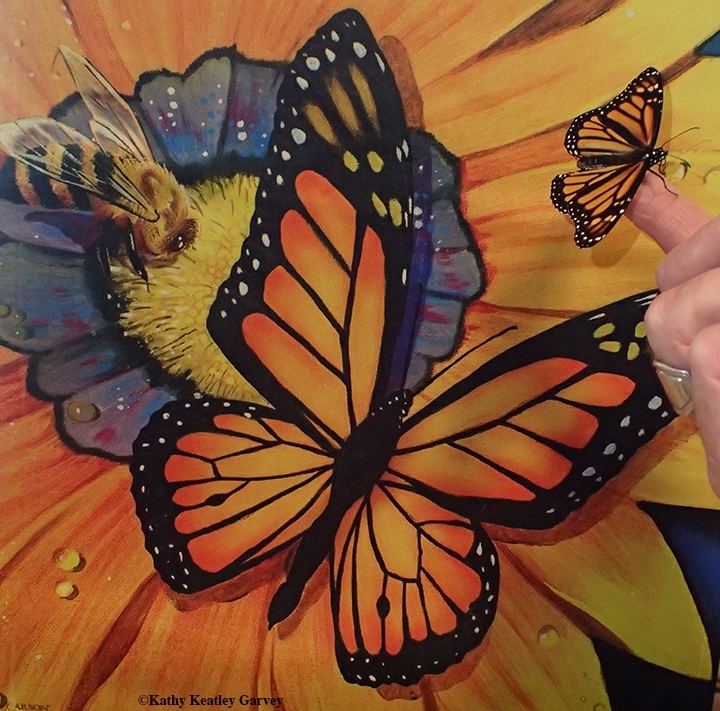 One monarch lingered on her finger--probably the one that had eclosed the day before. The others did not linger. “The rest flew away to meet their new friends,” she related. What a happy ending to a story about a small-scale conservation project that began in Vacaville and took flight in Santa Cruz. First we humans gave them roots; then we gave them wings. Yes, monarchs can be starfish, too.